This is the fifth in my new series of writing tips for kids. Over coming weeks you’ll see new short articles, each of them addressing young writers and dealing with a topic helpful to them. I’ve created a new List for these articles and will add to it over time. The List is embedded below. Have you ever begun to read a story, but soon started to yawn or lose interest? Great writers are like crocodiles, leaping from the swamp to grab their prey. They like to start their stories in a way that grabs their readers by the throat and doesn't let them go. In writing, we call this a HOOK. Beginning a story with a big chunk of narrative or description doesn't really hook a reader. Writers do use narrative and description in stories, but mostly not right at the start. It's better to weave those details in later. Instead, we choose action or dialogue. When we start a story with action, it should be the kind of action that a reader will find intriguing, and want to read more about. Crash! Jack's head jerked up, and he saw an elephant's rear end appear in the hole in the ceiling. Slowly but surely it slid further down, its massive legs waggling and its calls of distress echoing around the room. How on earth had Saggy followed him from the circus and what could Jack do to rescue her? We want to read on, find out how an elephant got above the room, discover who Jack is, and what happens next. It's the same with dialogue. "So are you in or not?" Crystal asked. Nicki frowned. "You swear I won't have to do anything dangerous to join the club?" "Of course not. You just need to wear this bucket on your head at school tomorrow." We want to discover whether Nicki will wear the bucket, and we wonder if we would be game enough to do that! It's important to give your readers an idea of your main character's problem and the event that starts his/her adventure near the start of your story. In the first example, we know or guess that Jack might have run away from the circus but he has been followed by an elephant. Now he has to rescue Saggy. In the second one, we figure that Nicki wants to join a gang, but she must do something strange to qualify for it. Don’t forget to keep your story moving along at a fast pace after your active and interesting start! Writers need to be crocodile hunters too. We need to read, read, and read some more. While we're reading, we hunt for great hooks. If we find some we like, some that quickly capture our interest and make us desperate to continue the story, we make a note of them. In our own next piece of writing, we can piggyback on that writer's idea, but create a wonderful new one that is our own. 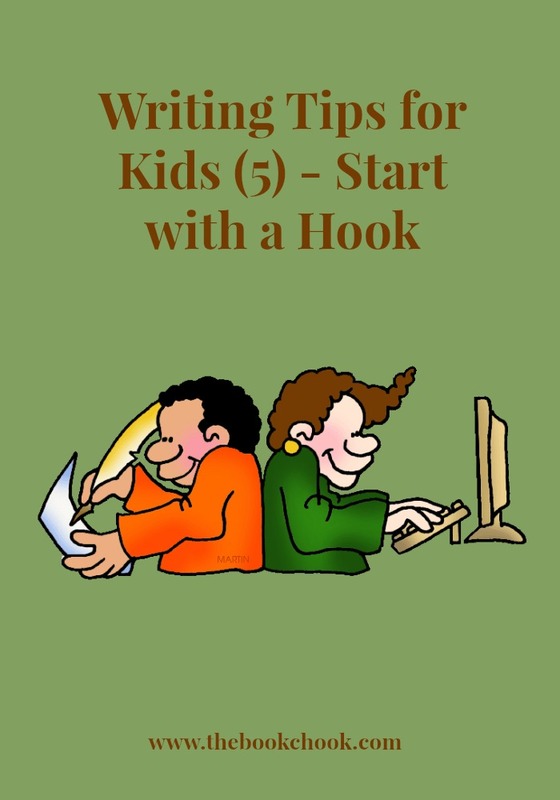 You might also like to read Writing Tips for Kids - How to Start, Writing Tips for Kids 2 - Write What You Know, Writing Tips for Kids 3 - Developing Characters and Writing Tips for Kids 4 - Writing Funny Stories.